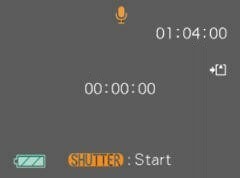 The Snapshot record screen. 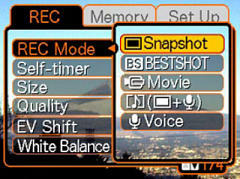 The top-center icon indicates the record mode (Snapshot, Best Shot, Snapshot+Audio or Voice) Upper left is showing icons for flash mode (off), infinity focus mode, daylight white balance, and self- timer. There's space for 10 pictures at the current settings of 1600x1200 Normal and we are using the camera's internal memory. 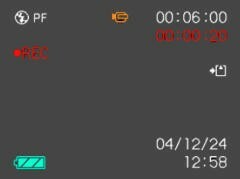 Lower left is the status of the battery and on the right is the time and date of capture. Center left is the real time histogram display and in the center are the AF target marks. 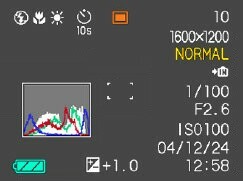 To enable the histogram, simply press the DISPlay button. The Z57 has five recording modes to choose from: Snapshot, Best Shot, Movie, Snapshot+Audio, and Voice. 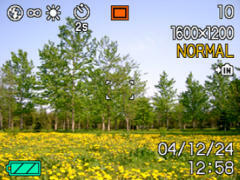 The Best Shot mode features different pre-programmed exposure scenes to make photographic tasks easier. You select the scene that best fits your needs and the camera makes all the necessary settings for you. 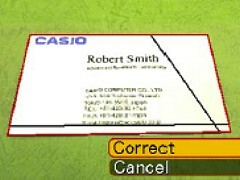 When taking a shot of a business card, document, whiteboard, or similarly shaped object from an angle, it can cause the subject to appear angularly distorted. Business card/Document and White board/Etc. modes automatically correct the shape of rectangular objects to make them appear like the camera was positioned directly in front of them. Here is a look at the Coupling Shot scene mode. 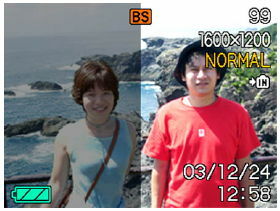 Coupling Shot lets you record images of two people and combine them into a single image. This makes it possible for you to include yourself in group images, even when there is no one else around to record the image for you. Pressing the Focus mode button allows you to switch between Auto, Marco, Pan, Infinity, and Manual focus modes (shown above.) 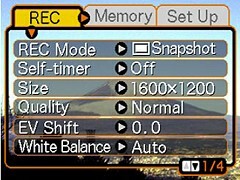 When using Manual mode, the center of the frame enlarges to help determine critical focus, a sliding distance bar is also displayed across the bottom of the screen. Here is a "busy" Snapshot screen. Across the top you can see icons for flash mode (off), Macro focus mode, daylight white balance, self-timer, snapshot mode, and there is enough room on the internal memory to take 10 more images. The 1mage size is 1600x1200 and the quality is Normal. 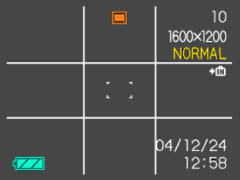 Below that is the memory icon, shutter speed, aperture, ISO, and the time and date. 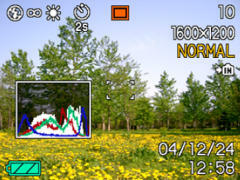 You can also see the live histogram display, battery level indicator, and exposure compensation is set a +1.0 EV. 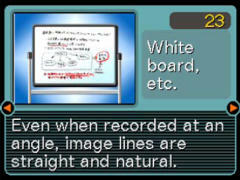 Here is a screen showing the framing Grid display. You activated this via the record menu. This is a helpful framing guide to ensure you get level shots. It can also be used like an audio recorder. Approx. 39 minutes can be recorded using the internal 9.3MB of memory. When using optional memory card the length is limited only by available memory, file size is 4KB per second. 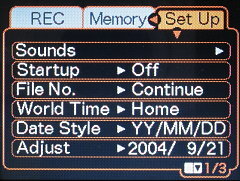 Standard Windows WAV format. 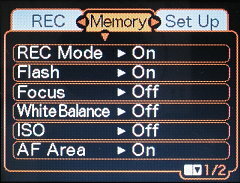 The memory tab allows you to setup the camera to remember specific settings like ISO sensitivity, white balance, focus mode, etc. 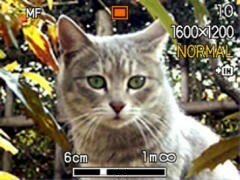 If not enabled, settings will return to the factory default when the camera is powered down.